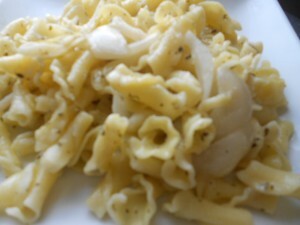 Super simple bell shaped pasta recipe with artichokes and goat cheese. In a saute pan, drizzle a bit of olive oil and toss in the chopped onion. Saute for a few minutes over med heat. Add the chopped artichokes and garlic and heat for an additional 2-3 minutes. Boil pasta according to packaging instructions. Strain. In a serving bowl, mix the warm pasta with crumbled goat cheese (it will coat the past well). Add the olive oil, fold gently. Stir in the onion/artichoke mixture and sprinkle with salt.